FUTA: Klass'16 Plead for NYSC Mobilization and Statement of Results. What you are about to read is a statement of one of the members of KLASS'16 I was able to get online via Facebook... and it states a lot of interesting things. 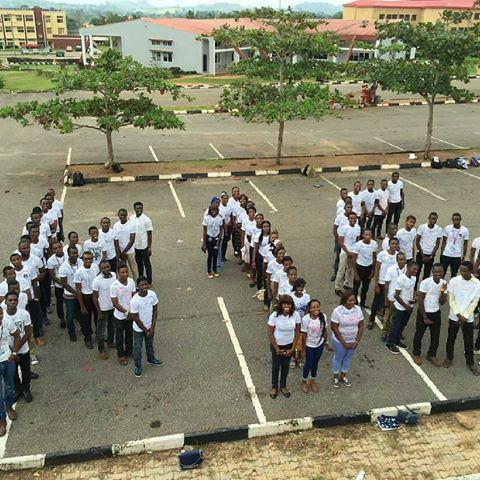 If you don't know, Klass'16 is a tag name for FUTA 2016 graduating students... Please read on. We were told from the news yesterday that klass'16 has delegated some people to meet Prof. Alese concerning their statement of result... Well, I don't know maybe they have met him.. Disregard any consolidating news telling you that they will allow the PROSPECTIVE CORP MEMBERS to go from the school without the VC leaving the sit. An angry member of the NASU said, it is painful that VC's child was mobilized last year who happen to travel from LONDON to come and check senate list at student affairs.. Imagine that!!!! Another member of the union said if it had been ASUU that have quarrel with VC, the students would have supported ASUU due to the direct relationship between them. Tell your parents, mobilize yourself.. Gather together, go and meet the VC to leave the sit or else you're all going no where because no member of the union will write your CERTIFICATE without him leaving the sit. Forward this to groups and let the campaign begin as we wait to get posting. If these post is true, then its unfair, the people we see as our parent for 5-6 year to say all these its very unfair after struggling to gain admission to school and at the end you are asking us to protest to ask the VC to leave the sit, who want to protest or have you forgotten how they will watch our protest and notice the leader of the protest, thereafter they use the person as bait for other's involve and judge them 2semesters or even rusticate them. we are asking you to at least tender your judgement with mercy we are not Prof Daramola's children, his children are done and he do not understand how we feel right now. We are children from both privilege and non privileged homes why not consider the non privileged and help us all because of us klass '16 please we all have few weeks to camp, You are our father and mother factor treat us like your own.